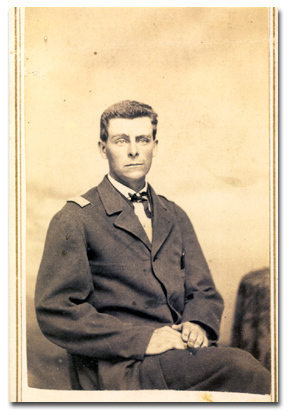 In the spring of 1861 George enlisted in the Hudson City Guards, later in Company G, 4th Wisconsin Volunteer Veteran Cavalry from Hudson, Wisconsin. He served as a Private from April 20, 1861 to January 24, 1864, when Gen. Banks as 2nd Lt. of Company D, 99th U.S.C.T, then commissioned him. Previous to this he went with Gen. Butler from Hampton Roads to Ship Island, thence to New Orleans and participated in the downfall of Forts Jackson and St. Phillips. In the campaign about New Orleans, the 4th Wisconsin was the first regiment to land in that city; he also participated in the battles of Baton Rouge and Port Hudson along with many light engagements and skirmishes in that vicinity. Lt. Hughes was employed for a time on the famous Vicksburg canal, and accompanied Gen. Banks Red River expedition as one of the engineer brigade, which had full equipment for engineering purposes, including a pontoon bridge. During the c otruction of the fort at Morganzia Bend, La., he served as assistant to the field officer of the trenches, Col. Uri B. Psall, under orders of Gen. Emory, and while engaged, in June 1864, had sunstroke, from effects of which he has never fully recovered. After rejoining the 99th Regiment he commanded his company until the end of the war. He was in command at Concordia and a Chattahoochee, Fla., during the reconstruction period at the close of the war, until he was mustered out, April, 23, 1866, having been for over five years in continuous service. While stationed in Florida George administered the oath of amnesty to hundreds of Confederates, and received many compliments from all sides for the impartiality, which he displayed in maintaining the strictest order. The citizens offered to purchase and fit out a printing office if he would undertake to publish a paper, which was declined for the reason that he was an old-line Republican, while they wanted the paper to be neutral on politics. He married Arianna H. Knowles in River falls, Wisconsin, October 20, 1868. Arianna was born in River falls, Wisconsin. She was the daughter of Persly Knowles and Betsey Giles. 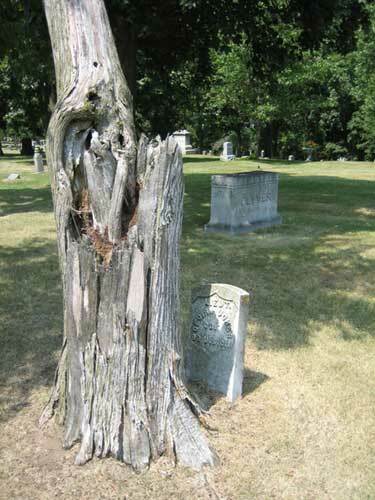 Arianna died November 24, 1882 in River Falls, Wisconsin. In the fall of 1866 George R. Hughes was elected register of deeds of St. Croix County, and re-elected twice. Later he became a real estate dealer and did a business loans, insurance and abstracts. After his wife's death in 1882, he spent about five years in St. Paul with his children never remarrying. In the spring of 1887 he came to Superior, where he compiled the first set of abstracts of Douglas County. Following spring he made another set of abstract books for the Superior Abstract Company. He eventually bought out that company and continued to run the business by himself. He then became the justice of the peace of the First ward of Superior. He was secretary of the Albany Realty Company, which owned much property in New York and Superior.